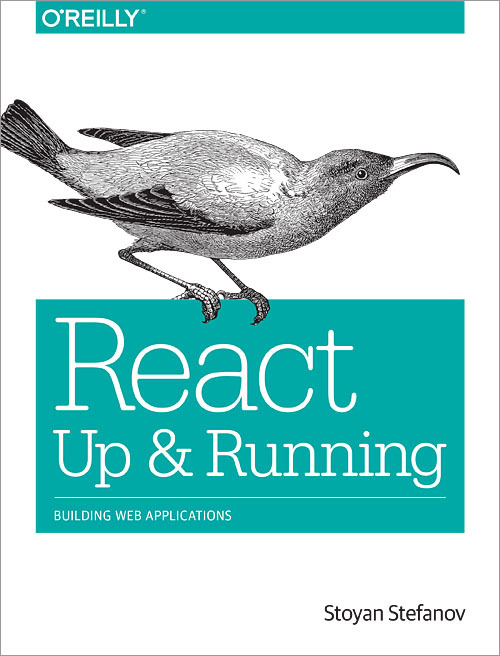 I'm a little late (like, omgbbq, 2 months late) with this announcement, but here goes: I published my new book, called "React: Up and Running". Go get it everywhere where books are sold and learn React from the ground up! That's why I took a different approach - start and go on for 3 chapters with 0 setup and extraneous tools. You learn React proper and that's it! All it takes an HTML page and a text editor. Just like the old days. Chapter 4 is the first one to add new syntax - the optional, but common JSX. Still though you manage by with a simple HTML page and in-page code transformation. The rest of the book, once you have a firm grasp of the basics and the JSX syntax continues on to create a more real-life app, while still building on the code from chapters 1-4. The app is a CRUD-type app called whinepad.com. The DIY bits are in there instead of simply using out-of-the-box WebPack or Redux just because there are so many options out there and I think it's best to know the behind-the-scenes so you can make an informed choice (or go DIY) with confidence. That's pretty much it, go get the book, let me know what you think. I'll probably post a little more about the writing/reviewing/updating process, trials and tribulations over at my other personal blog. So far the book has gotten some pretty nice reviews on Amazon and I'm grateful to people who take time to write up a review that helps potential readers decide if this is the best book for them. My favorite book on React. One of the things I find frustrating about so much of the React, and Angular2, material is that it always starts with all kinds of setup Grunt, Gulp, Bablel, Webpack, ES6, all of that is important on it's own, but you can't get to the framework without going through it. This book is different. It introduces React, just React, and does it with plain ol' ES5. You learn about the components, the lifecycle, what React is all about. Then he moves on to JSX, and starts to include the build process. The teaching apps get more involved and things build on earlier material. I also have to say that the choice of examples, while fairly simple, do a great job of showing "hows and whys" of React. Not a big book, but it's full of good material!